Brown paper has long been my favourite way to wrap – simple but effective. It looks so elegant and you can change the look with different ribbons, washi tapes or stamps. Plus, unlike lots of Christmas wrapping paper which has shiny foil on it, you can recycle brown paper. I usually get my paper from Wilkos where it’s cheap as chips. The lovely ribbon in the picture below is from the Christmas Ribbon three pack from Talking Tables, and gives a really elegant finish. They also sent me the Party Porcelain Gold Ribbon Spool you can see in the picture below, which is almost too beautiful to use. This is something I’ve never tried before, and I love the idea of personalising your own paper. 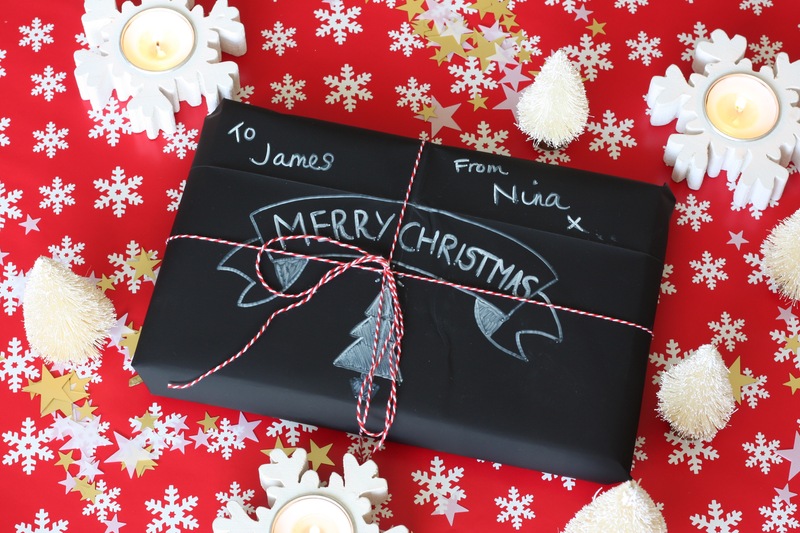 The Chalk Board Wrapping Kit comes with two large sheets of paper, a chalk pen and the red and white twine too. I love the effect, but I have to say the pen wasn’t the best. It wasn’t very vivid and ran out quickly, so maybe get your own chalk marker if you want to give this a try. 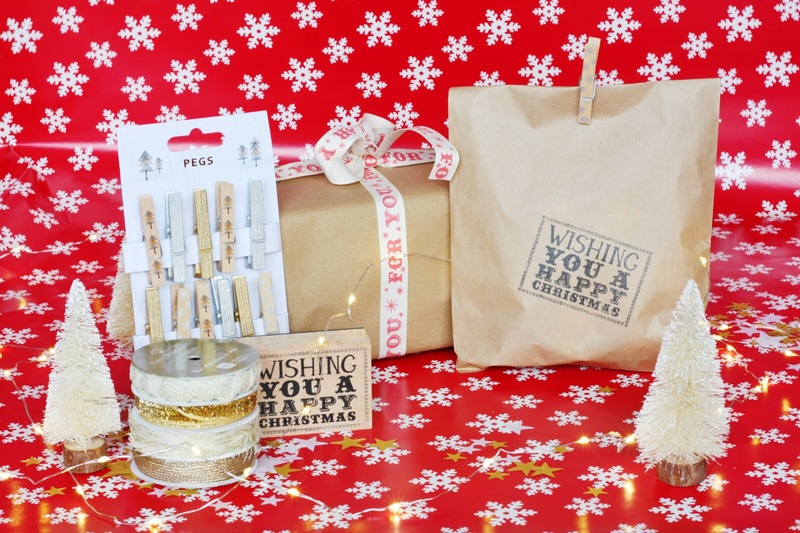 Wrapping is all well and good, but for those pesky little items only a gift bag will do. These Kraft Paper Bags keep with my favourite brown paper theme, and I decided to use one of the Nordic Christmas Wooden Pegs to fasten it. I added a bit more festive fun to mine with the ‘wishing you a happy Christmas stamp’, which I love and will no doubt be stamping on everything vaguely festive this year! The bags are quite small but would be perfect for small gifts or little goodie bags full of chocolate coins and other festive delights. The pegs can also be used with string to hang up Christmas cards, which would look great. Hopefully that has given you a few quick and easy ideas for first class wrapping. If in doubt, stick a fancy ribbon on it! This is not a sponsored post, but the items featured were kindly sent to me by Talking Tables. I love using brown paper to wrap presents too! I’ve never tried the chalkboard paper before though, looks cool!